For centuries, the Monadnock region’s unparalleled beauty and natural landscape has attracted our country’s most prestigious artists to the area. Our region’s focal point, Mount Monadnock, acts as great fodder for inspiration as it emerges alone from the hillside. Beyond the mountain, the landscape has a unique lushness, punctuated by more lakes than The Lakes Region of New Hampshire. Simply, there’s a lot to write about. To mould her sons as rugged and as brave. This passage from Lovecraft’s “To Templeton and Mount Monadnock” seems to capture Monadnock’s majesty. Lovecraft has posthumously became known as one of the 20th centuries greatest horror fiction writers, but this poem displays his artistic rang. We liked the way this passage heralds the Mount Monadnock and decrees its reign over all of New England. This is one of the most descriptive passages of Emerson’s poem titled, “Monadnock“. The prolific Transcendentalists writer begin to write the piece while sitting at the summit of Mount Monadnock on May 3rd 1845. We like how passage directly states that Monadnock is the “core” of the country and “pillar” of the region. May take a broad glance at the land. 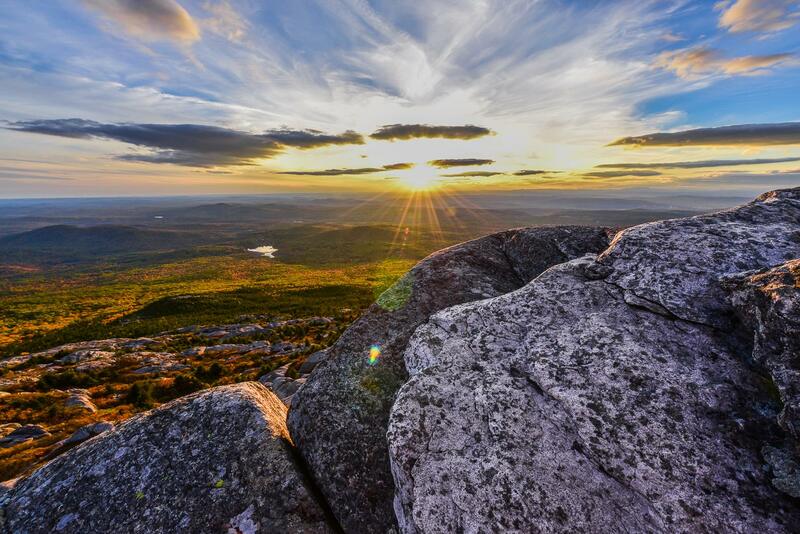 Though Parker’s may not have the same renown as the others on this list, we loved how this piece suggested Mount Monadnock’s immortality and timelessness. This passage is part of Parker’s longer poem “Mount Monadnock and its Surroundings,” which he wrote in 1870. Leonard Berstein one of America’s greatest composers wrote these sentences in a letter to Marian MacDowell after one of his three stays at the colony in Peterborough, New Hampshire. We loved the simplicity of the statement and its profound assessment of the depth of the region. That pyramid of nature springs! No sovereign but the King of Kings. This final passage by The Reverend William B. O. in his poem also titled, “Monadnock,” captures Mount Monadnock in a beautifully regal way. We liked how the passage was able to how the mountain has both power and prestige as a stand alone monadnock.